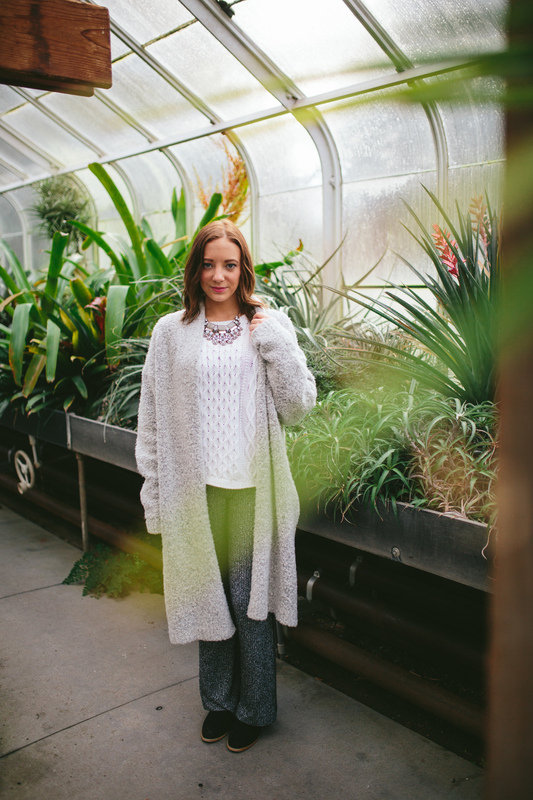 When it's winter in the northwest, I take grandpa sweaters and my layering of chunky knits very seriously. In the past, I felt like I was wearing frumpy pajamas when I'd wear too many knits at once, but now I fully understand the key to success: mixing and matching varying knits in a stylish way all while feeling like you're in your pajamas. Talk about a win/win. 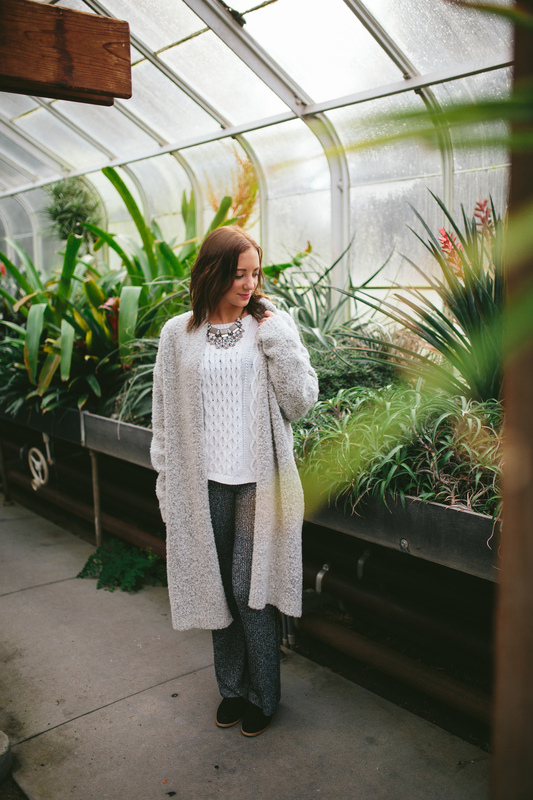 In this first look for my Pastels & Knits collaboration with KNDM Co. 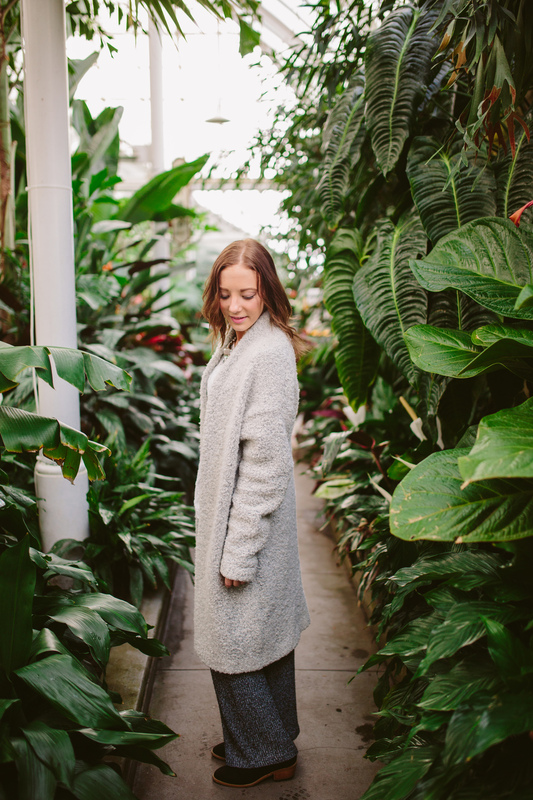 I am cozying up at the Volunteer Park Conservatory in Seattle -- one of my new favorite locations! Wearing my new favorite investment: charcoal flared knit pants from Forever21, I couldn't be more cozy in the winter (they seriously feel like pajamas!) These pants are surprisingly light-weight which means they are perfect to pair with heavier knits and overcoats. In this look, a simple cable-knit sweater from Nordstrom keeps the look neutral while my main focus and favorite layering piece of this look would have to be my grey grandpa cardigan sweater from The Loft. This sweater is meant to be fashionable yet bulky and eliminates the need for a jacket or coat in the winter -- an item I tend to get sick of wearing everyday in the winter. This look may not be extremely form-fitting but the key to playing up otherwise loose and baggy knits is with feminine accessories. My accessories of choice for this outfit? A bejeweled statement necklace from Forever 21 and my reversible Street Level Tote from Nordstrom. I recently overheard the words cozy chic uttered, and I think I actually might be getting the hang of it!